The handy WSA-100 utility box takes convenience to a whole new level. Whose garage couldn't use a couple extra electrical and air outlets? Mount the WSA-100 on your BendPak lift to turn it into a new one-stop hub. The industrial-grade WSA-100 utility station adds air and electric capabilities to any BendPak lift. Simple, safe and extremely easy-to-use, this air /electric workstation is an essential accessory for your garage or shop and increases the usefulness of your BendPak car lift. 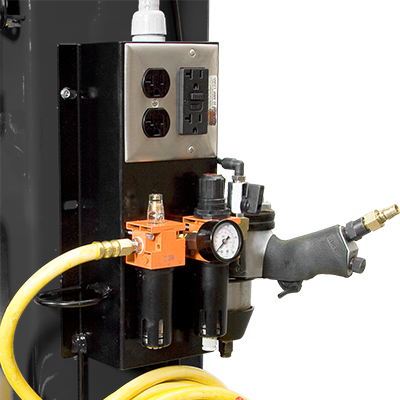 Includes four electrical outlets and specialized air service outlets, one for tire inflation and one just for pneumatic tools.